Do you know someone who spends far too much time on Twitter? Do they tweet to announce they're going to bed, and then again to say they're awake? Do they brag about how many tweeps they have? Do they refer to you in person as "@" yourname? If you answered yes to any of these questions, your friend may have a clinical addiction to Twittering. 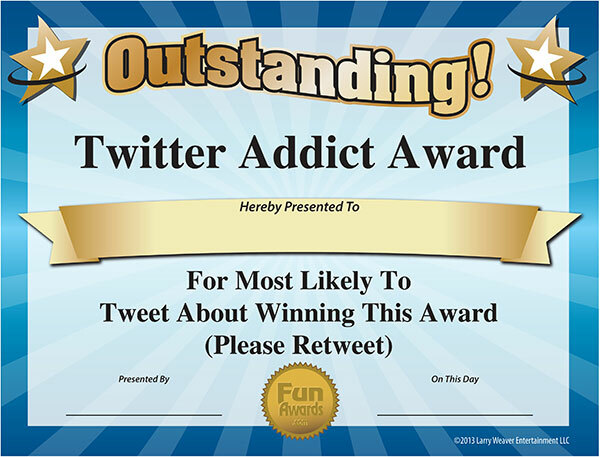 Show them you acknowledge their Twittering excellence with this free funny award. Download the certificate, type in their name, and post it on their office door or cubicle. Then rush back to your computer and wait for the tweet.